Don't let your E30 get left in the dust! Great brakes let you go faster, harder! Even If you have less power then the competition, use your light weight and excellent brakes to beat them in the corners! If your making big power, now you can stop without the worry of brake fade or rotor warping! VAC Big Brake Kits have been designed and tested for track and street use including all out competition vehicles. VAC kits use ultra consistent and light weight Wilwood calipers. We always test the products we sell, we chose Wilwood because of their proven performance on our own racecars (and those test have been grueling), and excellent parts availability. Servicing Wilwoods is easy, and parts are available at speed and performance shops around the globe. 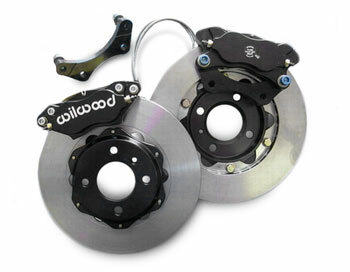 Plus, they offer very reasonable priced replacement parts like Rotors and pads. We have been making our own kits for years with tremendous results and lots of feedback. When we couldn't find kits we liked off the shelf, so we made them! Our kits offer excellent resistance to fade, tremendous stopping power and two things no other kit offers: SUPER light weight, much lighter than stock and the ability to fit smaller wheels for smaller, lighter tires. This VAC Big Brake Kit won't let you down. Our E30 kits are designed just for each application, They even fit behind 15" Wheels! Suitable for a daily driver or track vehicle! If you are looking for brakes for a custom setup, give us a call or email and we can tailor a kit just for you! What size and grade are the rotors in this kit? What kind of calipers are used? Can you sell a component/s from this kit? No, these kits are only available complete. All replacement parts are available to previous purchasers only. What type of pads are available?